We're following that post with a series of short profiles that will collectively provide a starting point for an exploration of international blogs, online magazines, and pages. We began by looking at Kilele, We Take Pictures Too, Arab Image Foundation, Greater Middle East Photo, Space Cadet, Street Level Japan, Kantor Berita MES 56, Japan Exposures, Invisible Photographer Asia, my new notebook, oitzarisme, La Fototeca, ZoneZero, and Panoramica Galerie. Today we continue with a look at Japan-based reminders: I WAS THERE. In a sentence: The site presents single images accompanied by the story of the "behind the lens" experience of making the image. 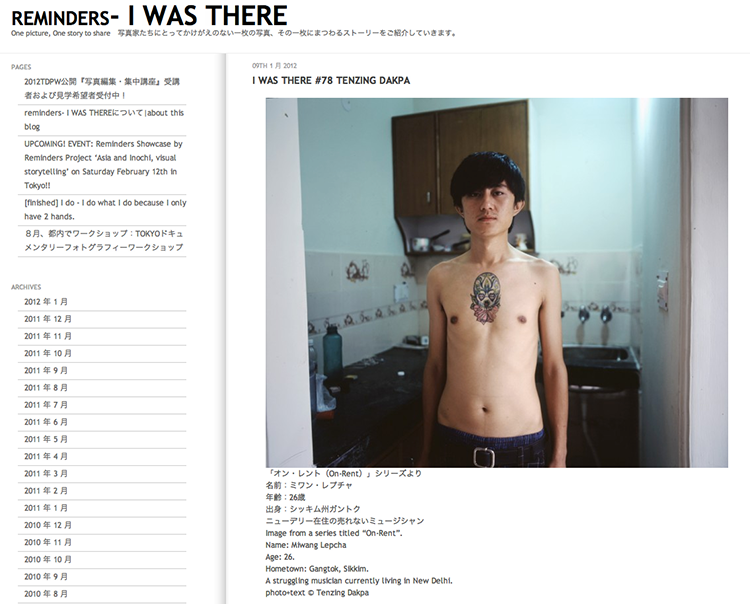 reminders: I WAS THERE aims to present images that the photographer has a particular personal connection with, giving a textual account of the experience of making the photograph in both Japanese and English. It's a formula used on other sites, including here on fototazo as "The Image" and on Flak Photo as "Flak Photo Stories," but on reminders: I WAS THERE the emphasis is on Japanese photographers in particular and serves as an entryway into contemporary work by young Japanese photographers. The site sidebar also lists various workshops and other upcoming events in Japan.